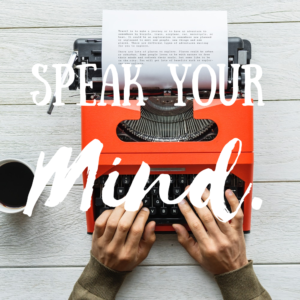 Diane Vich → Advice → Speak Your Mind! Speak your Mind! Share your story. Speak your truth and share from the heart. If there is one thing I have learned over these 2 months, is that speaking your mind is essential. If you have ever suffered from emotional abuse or trauma, it is hard to share your voice or speak your mind. It is hard to feel accepted and understood by others. You lose sight of your voice and its importance. It has always been hard for me to speak my mind. I suffered from anxiety and fear of public speaking all my life. It is easier for me to write a paper or story, than to speak it. I can write it all down in a journal, letter or story but getting up and Speaking, is another story. Over the past several months, through networking and social support, I have been able to reengage my voice and understand the importance. I realize now how important it is to express yourself and get your emotions out. The more you hold in your feelings and emotions, the more health issues develop. That was my biggest issue over my life, my physical and emotional pain, was triggered by keeping all my feelings and beliefs trapped inside. I never felt my voice was important, I didn’t think my story needed to be told, or that others would listen and appreciate it. I have learned through the relationships I have built this year, that my negative voice, was giving me the wrong idea. People have welcomed me and accepted me into their social realms. They have cherished the stories, I have told and the journey I have experienced, they see me as a powerful woman that is going to change the world. It was hard for me to see and accept the truth until now. My voice was hidden for so long, it has been a process to get it out. I realize today that those that don’t let you express yourself, don’t deserve your company. If you find someone that holds you back, break the connection and move on. Your voice needs to be cherished, your feelings heard and your knowledge expressed to those that will benefit. I have met many people over that passed years and realize not everyone deserves to be part of my life. Those that help you become a better person and achieve your dreams, are the people you cherish. The individuals that foster your growth and development are the ones that earn your respect. The relationships you build need to be supportive and nurturing. You will encounter people that you think are interested in your intellectual mind, power and knowledge but they might not be honest or true. It is important to surround yourself with those that support you and guide you in your journey. There is no point in creating relationships with those that don’t enhance your individual growth. It is simply a waste of time and energy to engage in relationships and friendships that tear you down. Your voice needs to be heard, your struggles expressed, your feelings shared and your journey supported. Surround yourself with those people that help you achieve all your goals and dreams. The people that continue to foster and support your growth, wellness journey and life goals are your true friends and companions. Keep them close and grow those relationships, you will see how you grow with them.